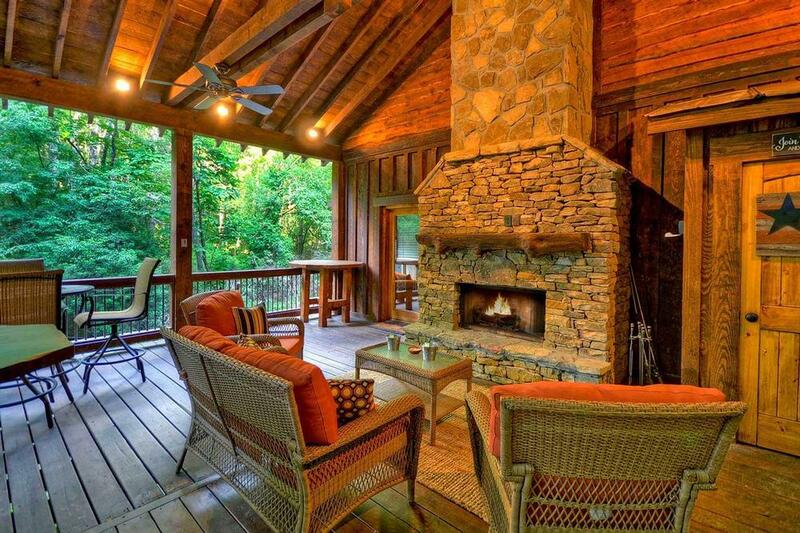 Is your ideal North Georgia cabin rental surrounded by nature in a beautiful, secluded wooded setting, or so close to a stream that you can fish for trout right from the deck? 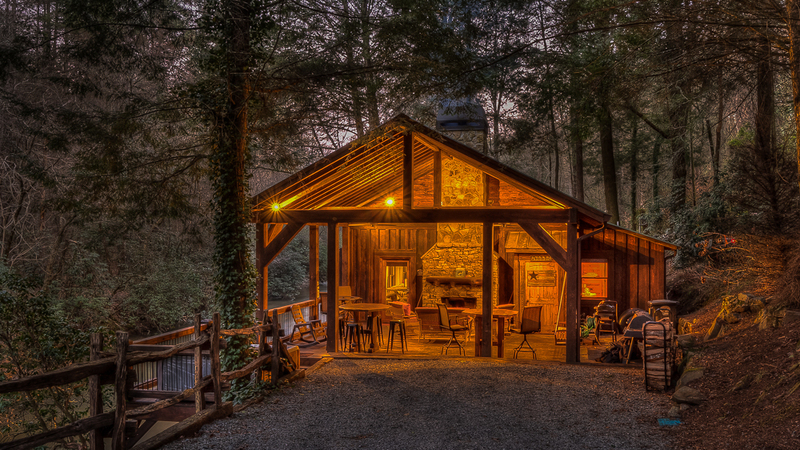 You get both at Creekside R&R, a cozy mountain getaway situated across from a nature conservancy on the banks of Fightingtown Creek, just a short drive from Lake Blue Ridge, Toccoa River adventure activities and the shopping and restaurants of downtown Blue Ridge. Named for the R&R--rest and recreation---leaves its military veteran owner enjoyed while serving overseas, the newly renovated cabin is cozy and luxurious, ideal for couples, a small family, or friends who want to enjoy nature and all the amenities of a high-end luxury hotel in a private, peaceful setting. Its interior is both rustic and elegant, with extensive use of natural live-edge wood, reclaimed barn wood, and stacked stone. 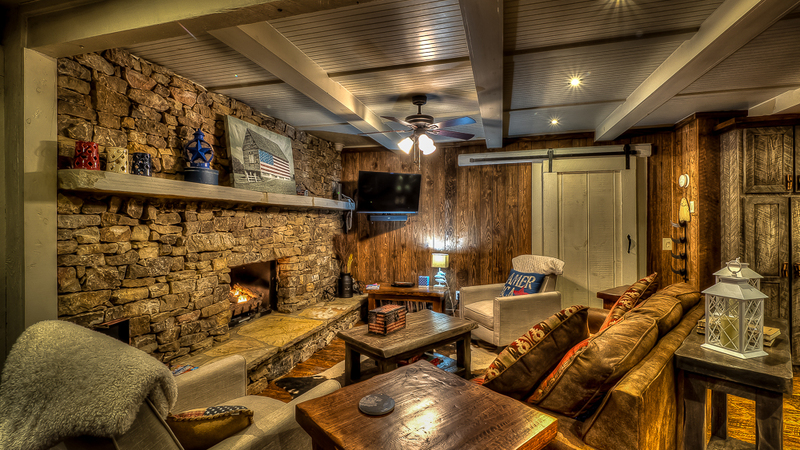 The flooring, lighting, and furniture are custom, the decor is vintage Americana, and the ambience is warm and inviting. 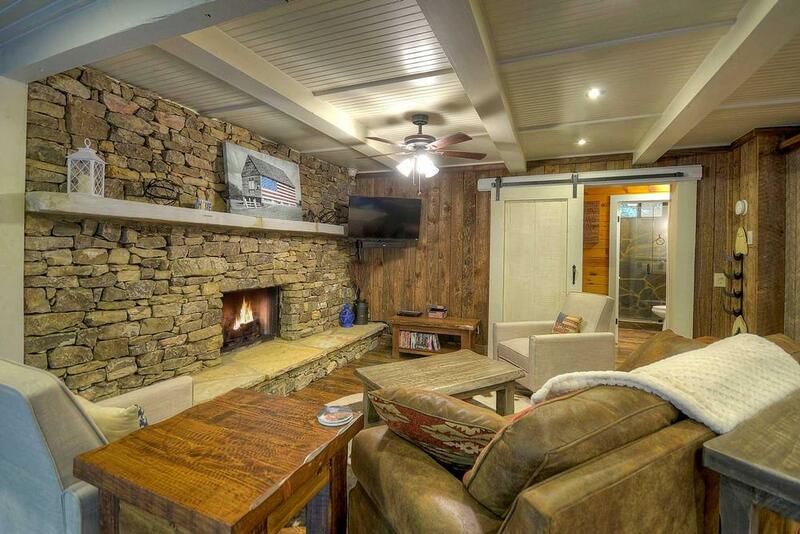 Settle into the leather sofa or recliner in the living room with its view of the creek and fire up the gas log fireplace while you watch TV, which has a Bose surround sound system. 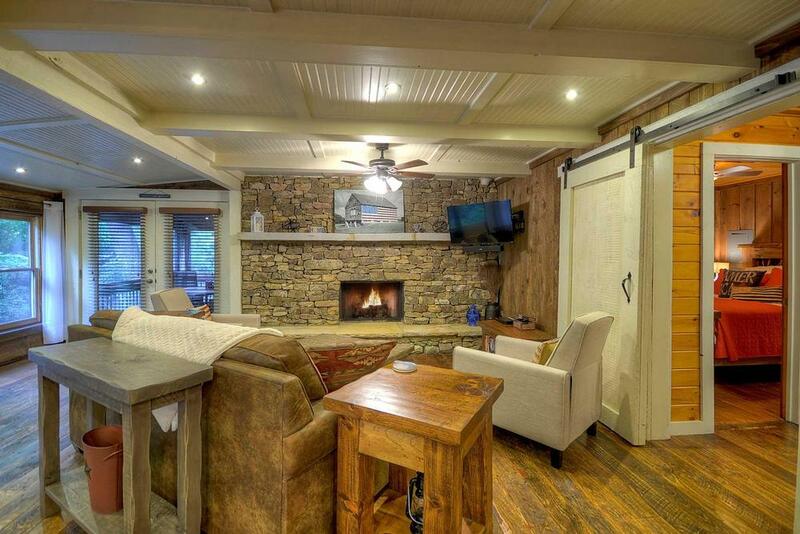 Or breathe in the mountain air as you relax year-round on the covered deck, with its stacked stone wood-burning fireplace, plenty of seating, and fabulous water view, which you can take in as you soak in the hot tub. You can fish for your dinner and grill it up on the smoker grill for a truly special feast. For inside cookery, you'll find everything you need to make gourmet meals in the custom-built kitchen, which features natural wood cabinetry, natural stone countertops, a stacked stone backsplash, stainless steel appliances, and conveniences like a Keurig and coffee maker, microwave oven, blender, toaster, and crockpot. 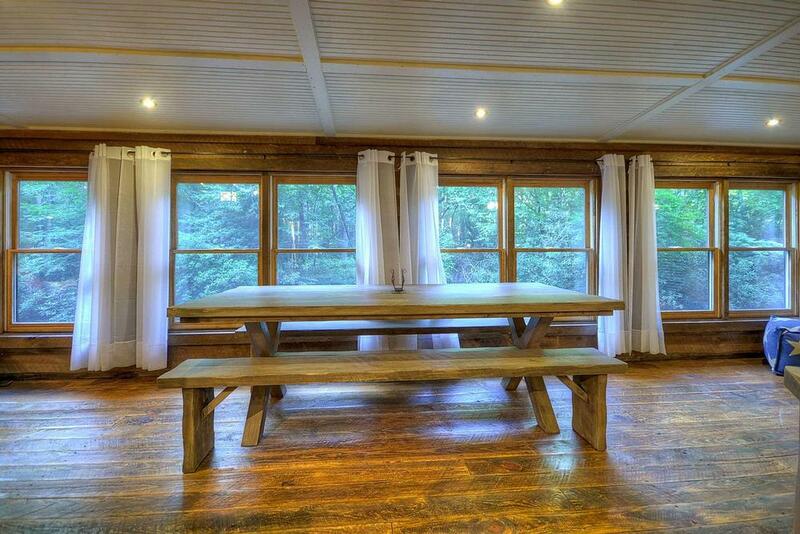 The farm-style dining table accommodates four to six. 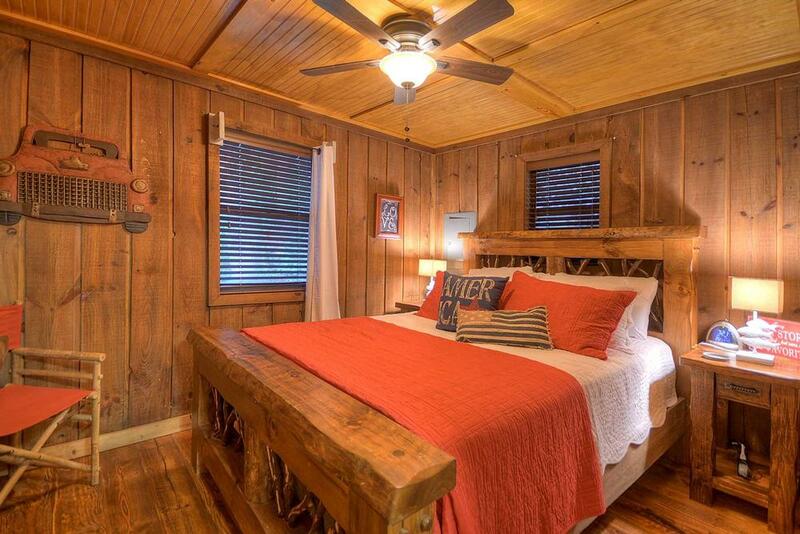 Creekside R&R sleeps four guests in its two comfortable bedrooms, each with a queen bed, custom furniture, ceiling fan and TV (all three flat screens in the cabin come with Blu-ray/DVD and Netflix). 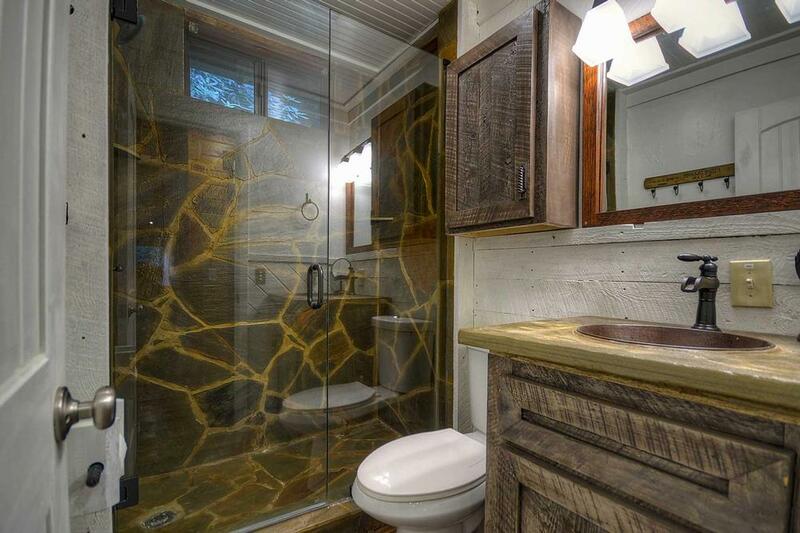 The shared bath has a stone shower and vanity and a copper sink and faucet. Other amenities include wireless Internet, DVDs and board games, and a washer/dryer in the hall closet. 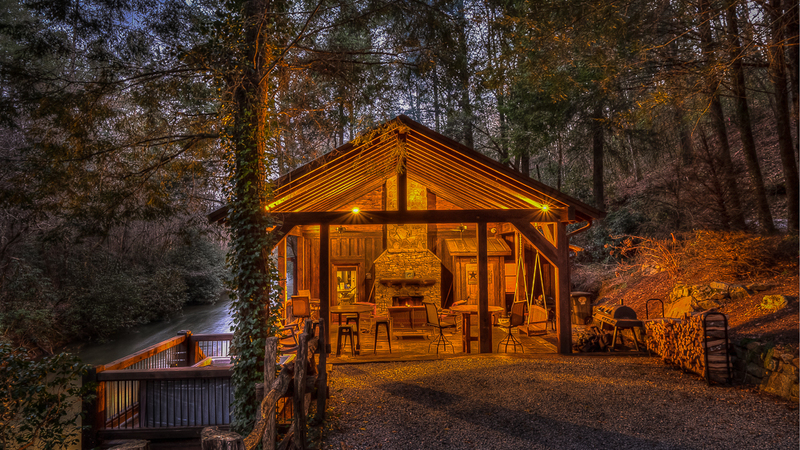 If you're seeking a fun getaway for romance, relaxation or family recreation in an amazing setting, look no further than Creekside R&R for an experience you won't soon forget. 03/19 - We enjoyed the outdoor fireplace. 03/19 - Beautifully remodeled, very tidy and organized. Excellent management company! 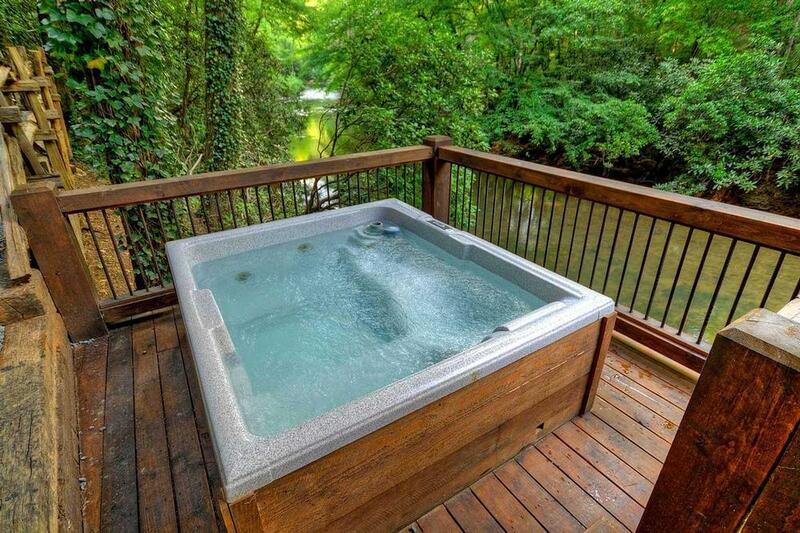 02/19 - Enjoyed the creek, outdoor living area, hot tub. Cozy living room and nice kitchen. The company and property were absolutely excellent - we'll certainly rent with this company again. Felicia was excellent! 01/19 - The hot tub was amazing and the kitchen was beautiful!! The nice view of the creek wasn’t terrible either;) also the directions provided were very informative and the signs posted to find the cabin were very easy to see even at night! The staff were professional and helpful. 12/18 - The cabin was beautiful and roomy and the location and views were amazing. There was more than enough room inside and out and all conveniences were provided. Friendly and accommodating staff! See you again soon! 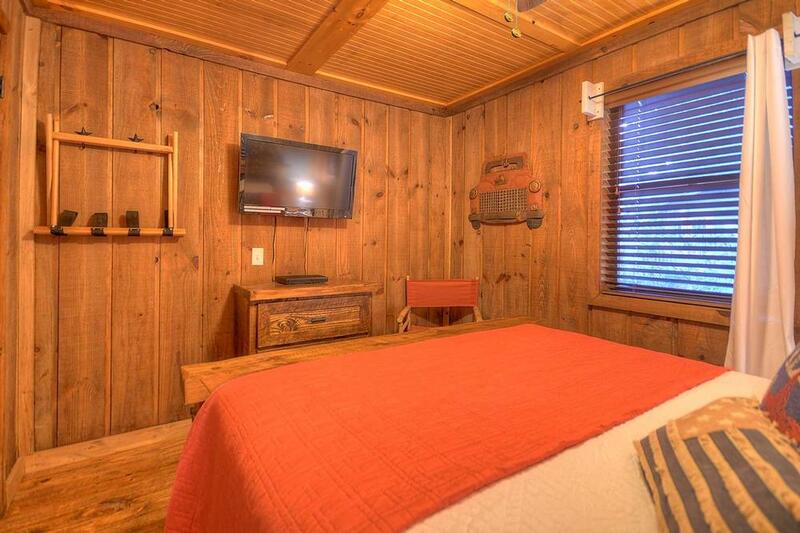 11/18 - Cozy and quaint little cabin. We appreciated the upscale kitchen and decor. Very pleased with the hospitality. 11/18 - The great room layout is very open yet cozy. 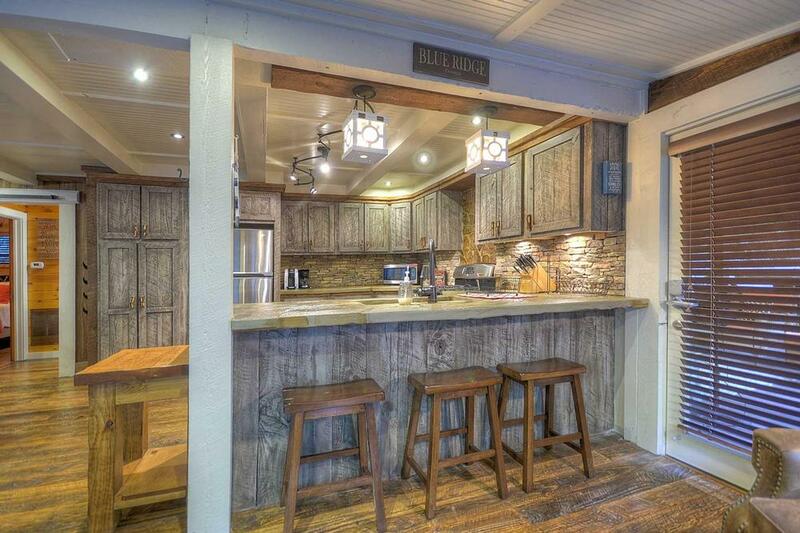 The kitchen is well laid out and has all the amenities needed for cooking. The master bedroom has a very comfortable bed. Your services and follow up with clients are wonderful. We have enjoyed all of your cabins and will continue to use your services in the future. 11/18 - Cheryl and I agree our vacation was PERFECT. No one has a perfect vacation, but we did. We stayed at two cabins, one at the top of the mountain (Eagles Nest), and one right on the river (Creekside R&R). We were very impressed by the immediate attention we got from staff to our little problems. Those who showed up at the cabin to fix little problems treated us like friends, and we felt the same way. 10/18 - Great amenities, other than no regular tv stations. Also, being on the river was awesome. Enjoyed the privacy, but the steep drive was.a bit of a pain. Great hospitality! 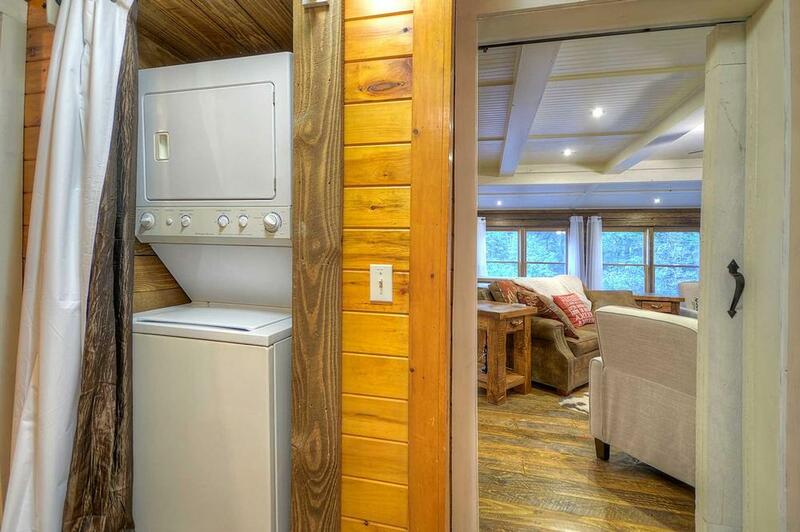 The best yet in all the cabins I’ve rented. 10/18 - We really loved how homey it felt. 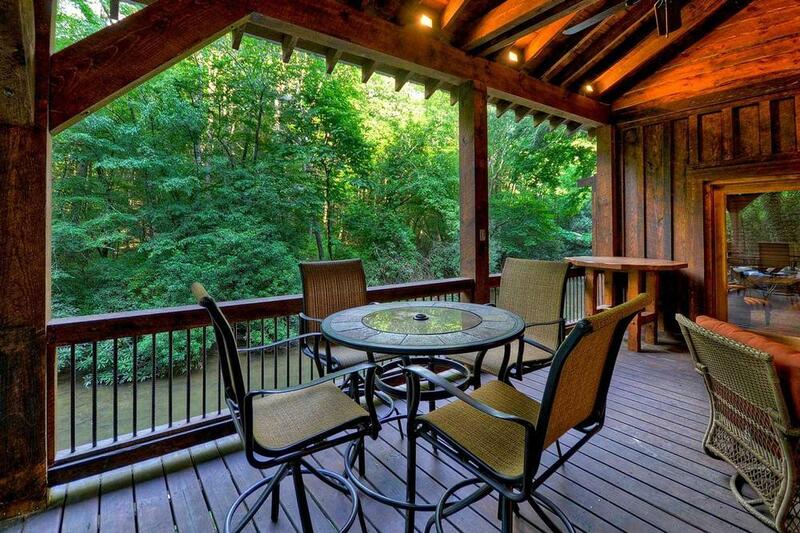 We also loved the huge porch, being right next to the creek, and feeling remote while being close to town. The staff was very helpful and friendly. The welcome package we got when we arrived was a nice touch too. 09/18 - Charming, patriotic, loved the outdoor fireplace. 08/18 - We enjoyed the outdoor spaces, common area and the setting. 07/18 - The red, white and blue touches, the fact that is Veteran owned. We loved it because it is on the creek. It's fully stocked, liked being at home, we just needed groceries. The staff are very pleasant to deal with. 06/18 - The cleanliness of the cabin. 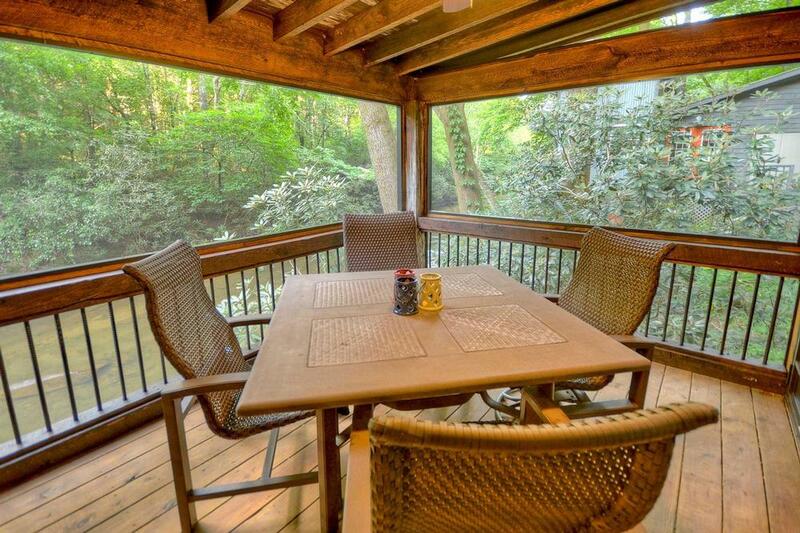 The outside patio and deck for fishing in the creek. 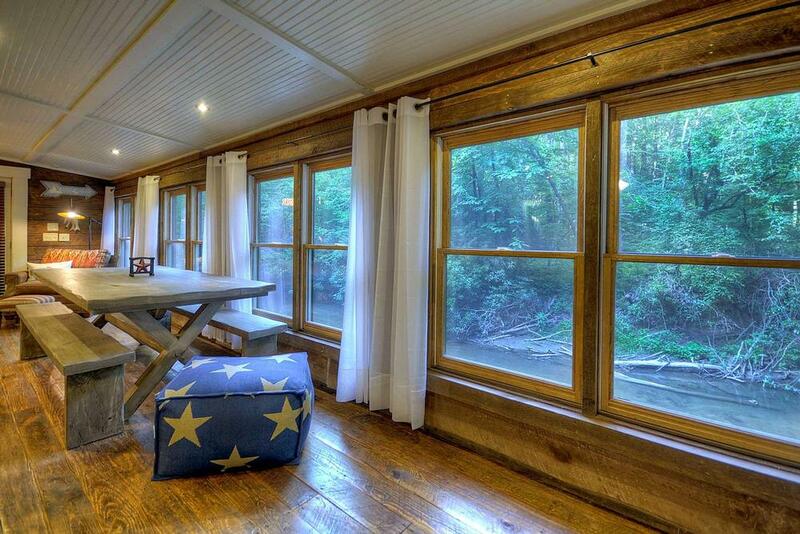 The cabin itself is awesome. My husband is a veteran so the decor was great. We also liked the fact that the owner also is a veteran. Will definitely be back!! Very easy to communicate with and helpful before and after our arrival. 06/18 - Covered deck stays dry even in a rainstorm, very restful with a swing and the sound of the creek. 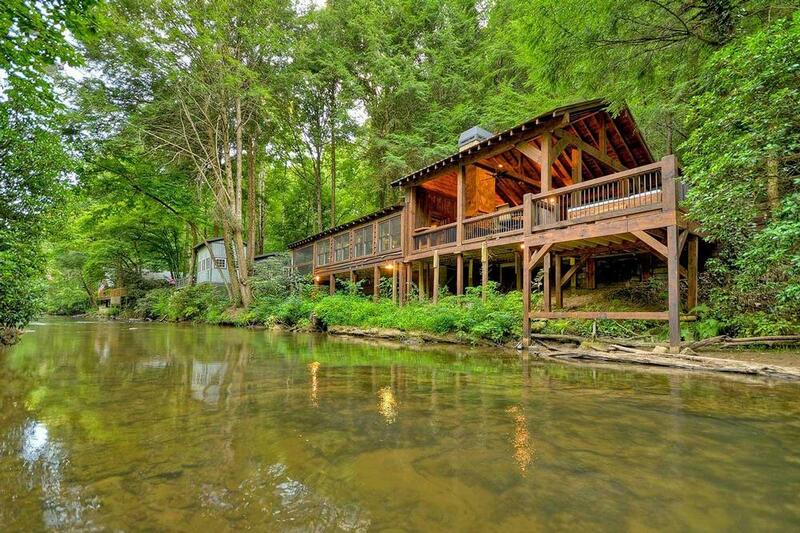 Creekside R&R is a perfect retreat for a couple. 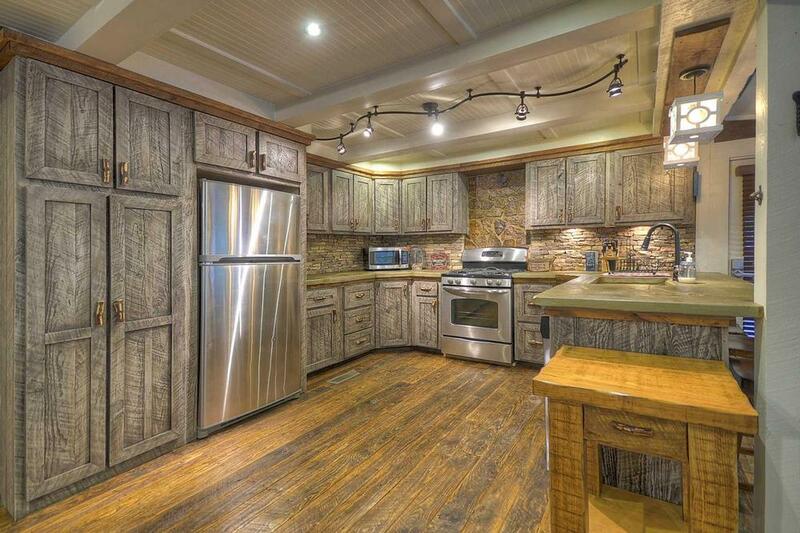 Terrific kitchen and well laid out, good lighting. Very helpful staff and quick responses to reservations. 05/18 - Location is fantastic. We liked being on the creek and we liked the privacy. The outdoor space with the fireplace and hot tub was very relaxing. Very happy with the experience. I have already recommended Escape to Blue Ridge to friends. 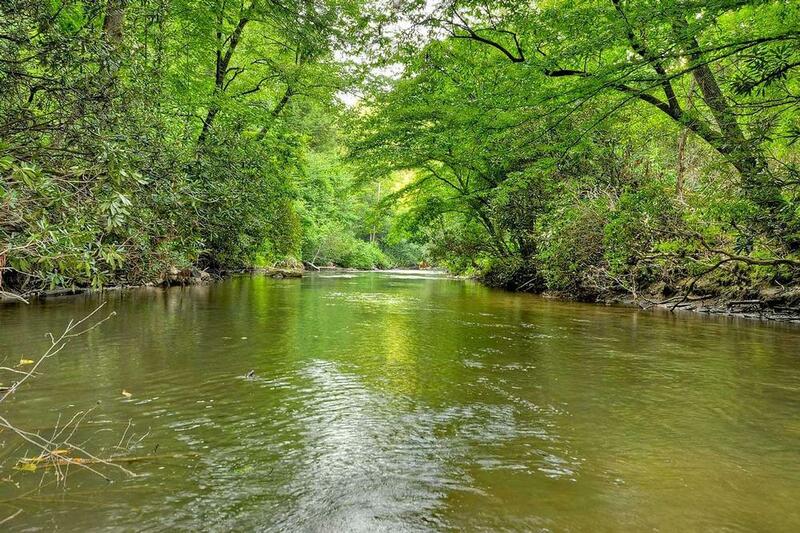 Beautiful view, peaceful and tranquil setting on the creek. I LOVE Escape to Blue Ridge! I have used your company for almost ten years and wouldn't go anywhere else! 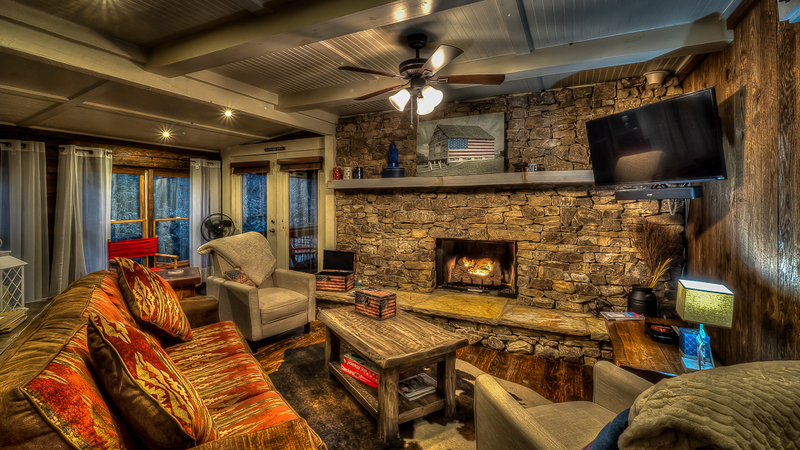 10/17- Our favorite features of the home were the creekside, outdoor fireplace area, entire cabin, hot tub! Great! 09/17- The home was clean and beautiful! Your staff was prompt and very helpful! 08/17- Location was excellent. 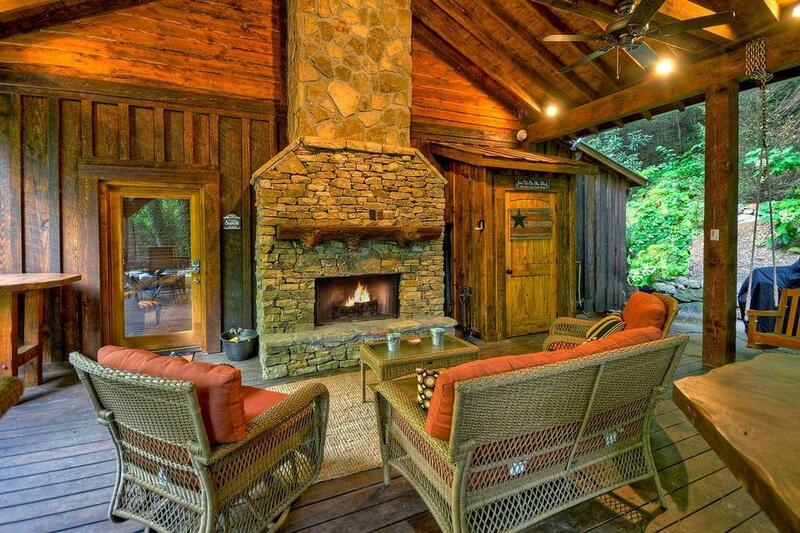 Outdoor living area was amazing. Love your company and will continue to rent through you. 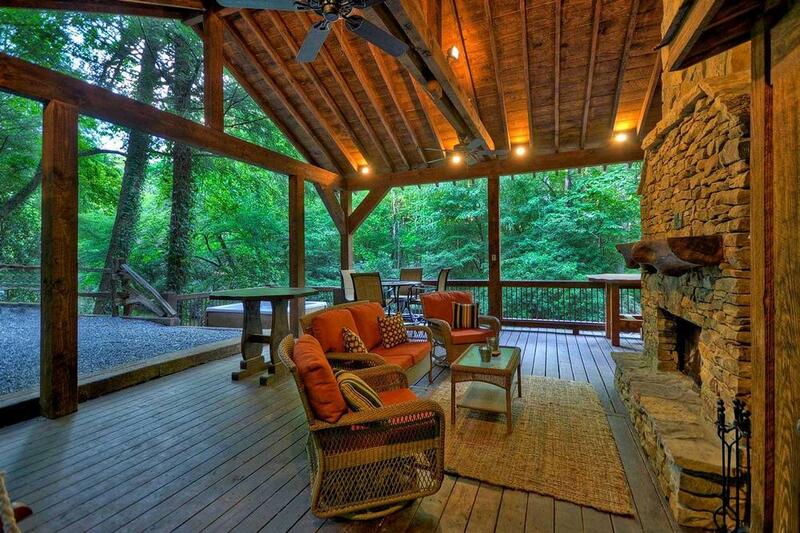 Hope to have a cabin of our own one day and be able to rent it through your company. 07/17- Cute cabin in a perfect location. 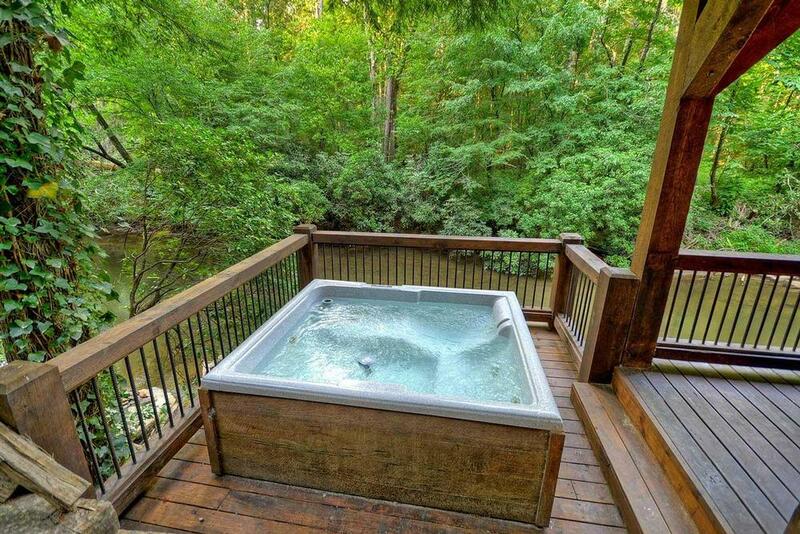 06/17- True privacy, tranquil, only the sounds of nature, amazing views, absolutely wonderful craftsmanship and care went into the construction of this amazing cabin, nothing was missed on amenities, hot tub and outdoor fireplace were amazing. We appreciated every aspect of our rental from beginning to end, what a pleasure! 05/17- We enjoyed the quiet surroundings. Very professional company. 04/17- The cabin is on the river, quiet, peaceful and relaxing. All one floor with no steps to climb. Absolutely loved it!!!! Wonderful company. 03/17- Beautiful view. Quiet and serene. Seems like a family owned business. Friendly and personable. 01/17- I enjoyed everything about Creekside R&R. Especially being close to the water. Also it's a very relaxing place to be. I'll return later in the year. Love your company and you'll be hearing from me again this year. 12/16- Incredibly cozy. Excellent experience as always! 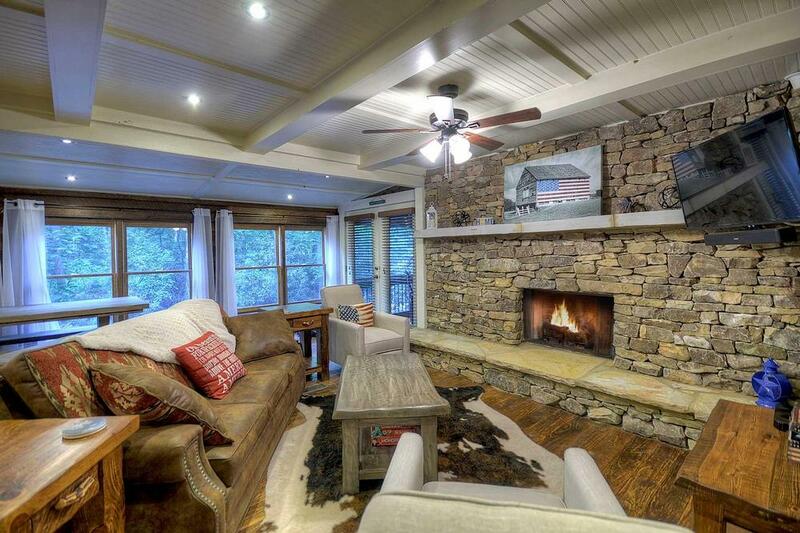 01/17- We loved the cozy feel of this home. Great company. 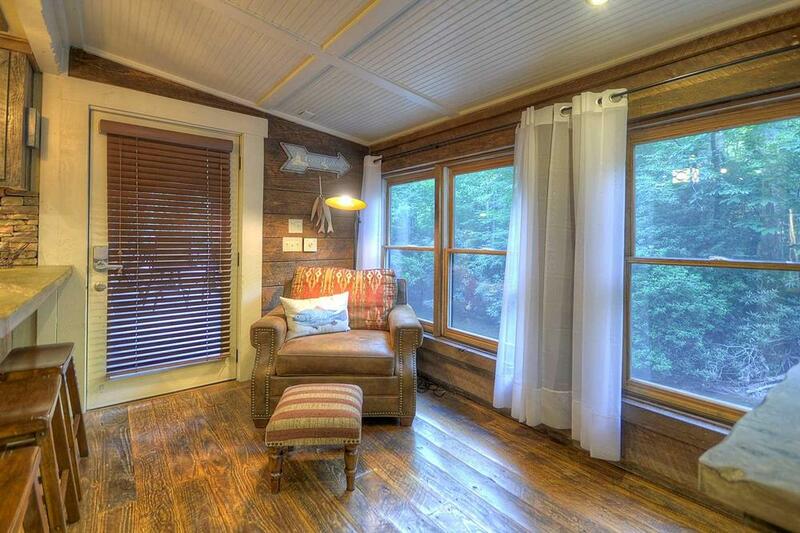 11/16- This was a cozy, romantic, secluded little cabin that offered most of the comforts of your own home. The customer service here was absolutely amazing. Any question we had was answered within minutes. 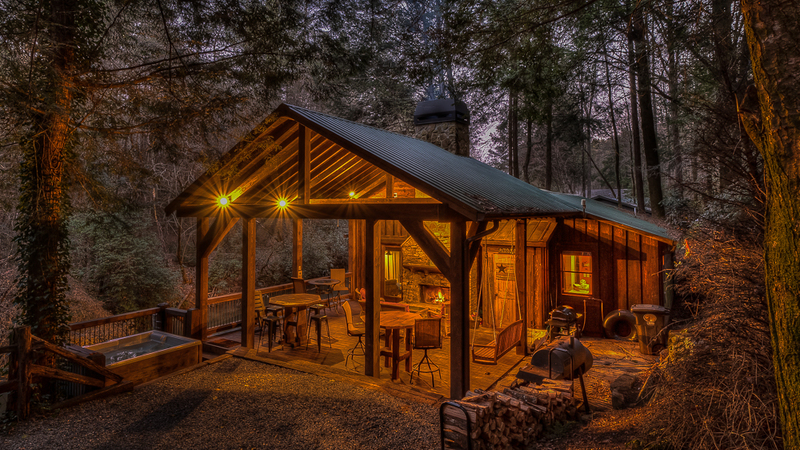 The cabin was immaculate, had everything you need to stay for a couple of weeks. 11/16- We enjoyed the proximity to the creek and the quiet. 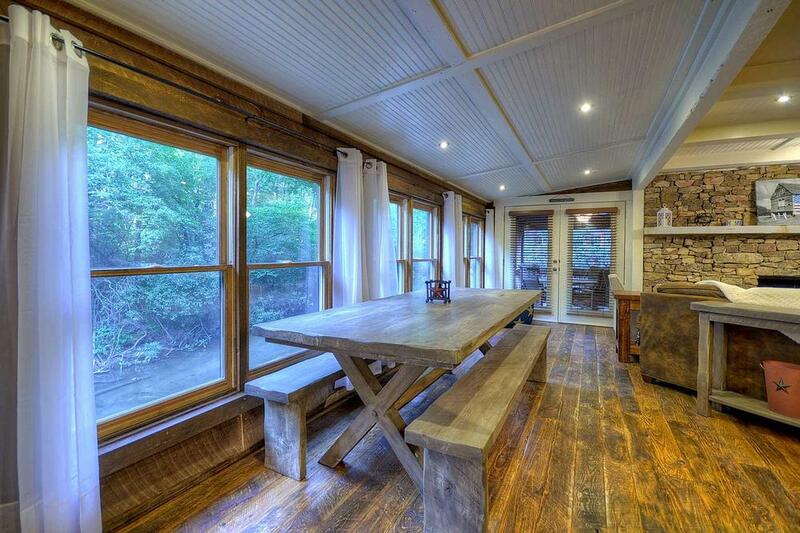 It truly is a beautiful cabin. We've been pleased with the company. 11/16- Loved being right on the water...beautiful creek side views. Super convenient to downtown and activities in all directions! Love EBR! 10/16- House was clean and neat. Escape to Blue Ridge Customer Service is very good. 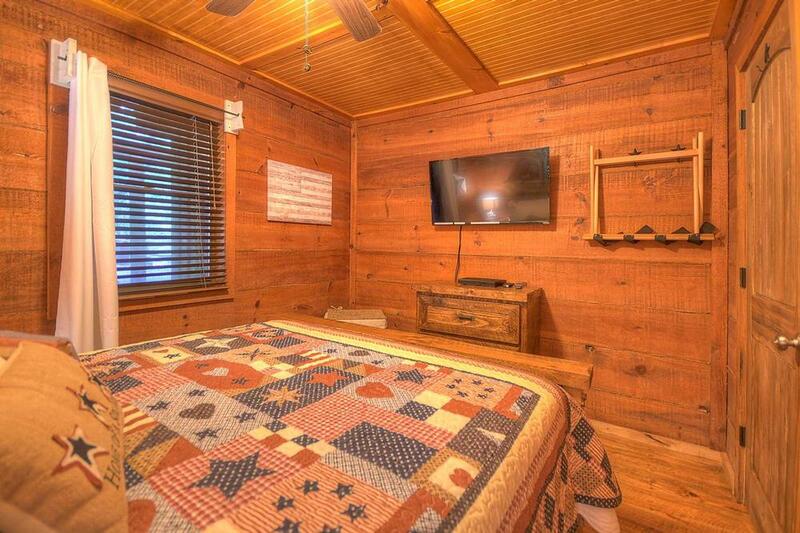 If you question a cabin give them a call. They will be up front and honest. Fourth year with Escape to Blue Ridge. Very easy to deal with and staff is always willing to try and help. Would highly recommend. 08/16- Small and cozy, just what we were looking for based on the needs of this trip. Decor was stunning and perfect! Very helpful, we arrived early in our travels to Blue Ridge and were granted early check in.